All the books in the Youth Peace Literacy Online Free Library can be downloaded free via our download page. A specially designed program to help young people live with care and respect for others. 6‐Week Program: Do I have a Bully Buddy in my Brain? Introductory Program. It’s as easy as A. B. C.
Lively color illustrations, exciting stories, and practical tips and role-playing exercises help give children the tools to avoid being victimized. Cope with the "Schoolyard Bully"! Stop bullies by using the "School of No Sword"! Gain the confidence to win without fighting! This book is also for adults searching for constructive ways to help young people peacefully confront hostile aggression. Illustrated by award-winning artist, Rod Cameron. "Webster-Doyle's insight is that by recognizing, understanding, and accepting our violent tendencies, we can avoid acting them out. These new books are good for teachers and parents of school children who need appropriate language and activites to help children deal with their feelings and the violence-provoking parts of their environment. To this reviewer, they are realistic and practical." This book is also for adults to help young people see how conditioning and prejudice affect us all. ¿Por Qué Están Siempre Metiéndose Con Nosotros? El prejuicio y la intimidación pueden hacer que tu cerebro haga que actúes de maneras que lastiman a las personas, ¡incluso sin que lo sepas! A powerful book designed to help young people understand the conditioning employed by the armed services to psychologically shape and influence their recruits. The book does not present an anti-war or pacifist argument—instead, it raises critical questions of free will and intelligent living. Full-color illustrations. “Every publication from the pen of this author should make a significant contribution to peace within and without. Highly recommended!" — New Age Publishers and Retailers Alliance Trade Journal. “Hello Dr. Webster-Doyle, I am a school principal, a parent and martial artist. I just wanted to thank you for this incredible book about how young people become conditioned to be warriors. This is the most unusual book that I have ever bought for my children! And perhaps the most important! I want to tell people that if you are concerned about war and what you can do to help your children understand what creates it then get this book. You could save their lives. Again many thanks for this intelligent peace-educating book. Peace - What Prevents It? The future of humanity depends on understanding what creates conflict – what prevents peace. What a great Master of Karate does with an umbrella. How to stop a bully from hurting you. How to get Real Power. Facing the Double Edged Sword can help parents, teachers, and counselors who are searching for healthy and humane ways for young people to cope with conflict. Este libro está dedicado a los jóvenes que han sido intimidados y se han sentido atrapados entre su deseo de venganza y el deseo de resolver las cosas pacíficamente. 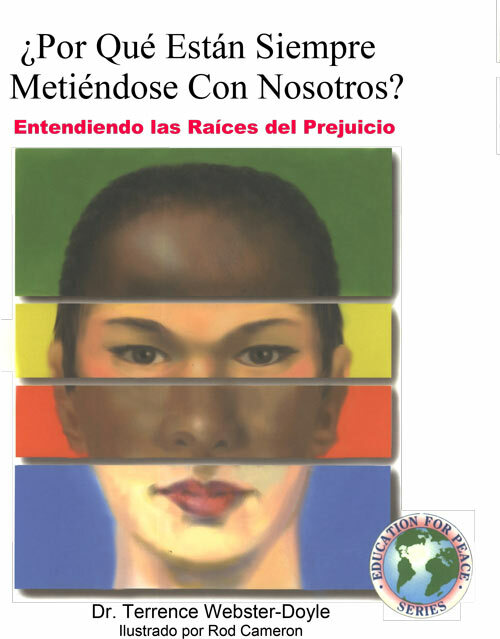 Este libro también está dedicado a los padres, maestros y consejeros que quieren ayudar a los jóvenes a entender sus sentimientos violentos y hacer frente a éstos en formas más humanas y sanas. This book is about martial arts that are for peace. It will teach you to resolve conflict peacefully, which is the true intent of all martial arts. It will also introduce you to the Martial Arts Code of Conduct, which all martial artists for peace have to understand in order to master these arts. Can you discover the secret in the riddle of the Empty-Handed Masters? And you can only have when you don't want it?" If you can discover the secret of this riddle, you will discover how the Martial Arts can become a way to Peace! How does your Martial Arts training help you to understand the mysterious teaching of the Empty-Handed Masters? "Teacher, I have no peace of mind. Please help me to calm my mind." "Student, will you bring your mind here so I can calm it for you?" "Yes, but when I look for it, I can't seem to find it!" "There, you see. I've calmed your mind already!" "Teacher, how is that you always think so clearly?" "I close my eyes," the Teacher responded. If you understand this then you too will be an Empty-Handed Master. This book's intent is to help create an understanding of the Martial Arts as a way to peace. Adults reading it together with young people can assist them in their education about relationship - what it means to live with dignity, caring and beauty in their daily lives. "You are caught in a maze of never-ending passages. Behind and gaining on you is a Fire Dragon! In front of you, down dark passages, around every corner, are unknown dangers. It is certain that you will be burnt up by the Fire Dragon coming from behind if you cannot escape. So what can you do to avoid being devoured?" Solve this puzzle and you will understand the most powerful force in all Martial Arts training. Are you ready for an adventure? "To say that I am pleased and delighted with the context and content of your literature is a complete and total understatement. The fact is, your writings are so unique and different from the average information on the market, that I find myself reading and rereading it for new and refreshing insights." For Children 4-8, this book explains the basic concepts of the martial arts, as well as showing what it is like to be a part of a class. A wonderful first book on the Martial Arts for young people. This latest book in the award-winning Martial Arts for Peace series teaches young people ages 6 to 9 about Respect, one of the most important goals of the Martial Arts Code of Conduct. As a response to young people being victimized by bullies, more and more parents are choosing to enroll their children in martial arts schools. But are these schools really teaching children what they need to understand and resolve conflict peacefully? We want our children to be safe. We want them to be self-confident and capable. We want them to acquire good values, to respect themselves and others, and to act with kindness and integrity in their relationships. Dr. Webster-Doyle demonstrates convincingly how conventional instruction in martial arts—focused on physical skills only—is not enough to help young people understand and resolve conflict. However, if they are introduced to awhole martial art, one that teaches how to avoid and therefore prevent conflict, young people can learn to deal with threatening situations powerfully and effectively, without resorting to physical violence. Included in the text are mental martial arts skills, a chart of nonviolent alternatives, active family role-plays, and other creative activities that parents and children can work through together. Both parents and their children will discover ways to deal peacefully with violence that are surprisingly simple, satisfying to practice, and immediately useful. "Karate—The Art of Empty Self is a mindful contemplation that presents only a few sentences on each of its 90 or so pages, making each page like a work of art to be savored slowly." The Art of Karate is a mirror reflecting the root of fear, which is the destructive division brought about by the image of ourselves. This division is the basis of psychological conflict. Because of the confident and trusting environment fostered by the Art of Karate, the student has the opportunity to allow this conflict, with its aggression and tension, to surface into the light of awareness. Allowing this fundamental conflict to be observed, without any action to change it, is the essence of "empty self" and the heart of the Art of Karate. "One Encounter, One Chance is terrific. It is one of the highest quality and integrity and it speaks eloquently to moral and ethical concerns." "One Encounter One Chance is a wonderful work of art (personally I think you should be awarded the Nobel Peace Prize)." This book takes a fresh look at the traditional principles of Karate, and especially a concept fundamental to all martial arts—that of the "empty self." It asks readers to let go of preconceptions of Karate as merely a system of self-defense techniques and to realize the true intentions of this remarkable martial art: a means for self-understanding and for peaceful resolution of conflict. Do I Have a Bully Buddy in My Brain? Companion workbook for children for the accompanying book and curricula sharing the same title, Why Is Everybody Always Picking on Me?. Companion workbook for children for the accompanying book and curricula sharing the same title, Why Is Everybody Always Picking on Us?.